A massage ball, or any ball for that matter, can be used to loosen tight muscles, release trigger points and relieve tension in the body. If used properly, a massage ball can also save you hefty professional massage fees and at the same time leave your body feeling revitalised for a low price. Using a massage ball before and after a workout not only helps prevent post-workout muscle soreness, but it can also help improve your athletic performance. But first, let’s have a look at why you should use a massage ball and what features you should be looking for when choosing the right massage ball for your needs. Why Use a Massage Ball? A massage ball is a must-have tool for anyone who wants to massage hard-to-reach areas of the body, such as the lower back, upper back, shoulders, hamstrings and neck. This type of massage tool is also essential for performing myofascial release, a type of manual therapy intended to release deep muscle knots to relieve pain and restore range of movement to the affected areas of the body. While a tennis ball can be used for this purpose, a massage ball is specifically designed to break up constricted soft tissues and target trigger points – small knots of tension within the fascia. Numerous studies have confirmed the effectiveness of massage balls in decreasing muscle tightness, increasing range of motion, and enhancing muscle performance. According to one study, using a massage ball may also help prevent post-workout muscle fatigue and pain. The premise of a massage ball is simple. Ultimately, it is a way to remove knots in the muscles which may cause your body to feel tight and uncomfortable. You can use a massage ball all over the body by applying pressure with the ball on the body parts you wish to massage. You can hold it on tender areas or roll it around using your hand or by lying on it. With the correct technique and right amount of time, you should feel release and the tension disappear. For example, if you feel your calves are tight you can use a massage ball to ‘release’ the tightness in the muscle, followed by stretching. By doing this, the massage ball will give you back greater range of motion and make your stretching much more effective. What’s so Special about a Massage Ball? You can use any ball. A tennis ball, a golf ball, a hockey ball or a bowling ball, it doesn’t really matter as long as you get the relief you are looking for. But there are common sizes, densities, weight and levels of firmness of a ball, that work better on the body than others. It all depends on which muscles of the body you plan to use the ball on. The massage balls on the market will usually have the qualities that make it the most versatile for use all over the body. Both the foam roller and massage ball are what one would consider as essentials in any myofascial release toolkit. If you’re starting off for the first time, then purchasing a foam roller is a good place to start. The foam roller will provide enough muscle release for people who have never done any myofascial release before. The problem is, at some point, you will reach a point where you will need something with a smaller surface area so you can sink deeper into muscles in order to get relief. If you feel that you’ve reached a plateau with a foam roller, it may be time to consider moving onto a massage ball. This is the advantage of using a massage ball over a foam roller has. It can hit smaller trigger points than a foam roller. The other advantage is that a massage ball can easily be taken around whilst travelling. A foam roller is likely to be too big to be packed neatly into a suitcase. If you do not have a foam roller but wish to try one out, see our page on the best foam rollers. There is no one massage ball that’s right for everyone. The best product for you will depend on a number of factors, including the parts of the body you want to massage, your tolerance for pain, and, of course, your budget. That said, there are a few basic features you should look for when determining whether a specific massage ball is right for you. Below are a few things to keep in mind while you shop. The size of the ball you choose is one of the most important factors to consider when buying a massage ball as the size of a massage ball will determine what parts of the body it can be used on. Generally speaking, smaller massage balls are best for massaging small areas of the body, such as the hands, the soles of the feet, the forearms, and the calves. Larger massage balls are better for massaging large muscle groups like the hamstrings, glutes, back and chest. Requirements will vary according to the part of the body and the size of the spot you are looking for relief in. Massage balls have a variety of surface textures, from raised bumps or spikes that mimic the fingers of a professional masseuse to smooth, soft textures that deliver less intense massages. When choosing a massage ball, you’ll want to choose one with a surface texture that is easy to clean and won’t slip on hard surfaces. A massage ball should have a slightly grippy texture to it. If its surface is too slippery the ball will not stay in place and may even slip out under you. For example, using a field hockey ball may be too slippery and slide out from underneath you. A massage ball’s density will determine how intense of a massage it provides along with the size of the ball. You’ll want to choose a ball that’s dense enough to provide a deep tissue massage without causing too much pain. If a ball is too soft it won’t be able to release trigger points which require a lot of intense pressure. If a ball is too hard it may be too painful to use. Much like size, whether you need something soft or hard will depend on how ‘tight’ in the body you are, how often you perform self-massage and also what part of the body you are planning to work on as some areas are more tender than others. The weight of the massage ball isn’t as important as the other qualities, however, if you want to transport your massage balls as you travel, then lighter is better. Luckily for us, most massage balls are light anyway. It’s important that the massage ball you buy can stand up to prolonged use without falling apart or changing shape. Choose a massage ball made from durable materials that won’t split or deteriorate over time. Many massage balls come with warranties that allow you to essentially try out a ball before committing to purchasing it. Before purchasing a massage ball, check to see how easy it will be to return if you decide it’s not the right ball for you. Now that we’ve discussed the basic features you should be looking for in a massage ball, we’ll review the top massage balls on the market, based on price, ease of use, and overall customer satisfaction. As stated earlier, which massage ball you get depends largely on what part of the body you want to use it on, and your own preferences regarding firmness. It’s unlikely that one massage ball will be able to meet all your requirements so it’s a good idea to have a set of different massage balls rather than just owning one. The standard Lacrosse ball is a tool that everyone should own at some point. They are of a great size, density and ‘stickiness,’ making them perfect for performing myofascial release on nearly all parts of the body. A lacrosse ball is an excellent tool for massaging small muscle groups like the biceps, calves, shoulders, and triceps. In fact, many physical therapists recommend that their patients use a lacrosse ball at home to perform self-myofascial release between therapy sessions. In some cases, a physiotherapist will even demonstrate to his or her patient how to use a lacrosse ball to treat muscle pain. Lacrosse balls have obvious benefits – they are inexpensive, for one, and are made from dense, durable rubber that is hard enough to provide a deep tissue massage. Its small size makes the lacrosse ball ideal for locating and releasing trigger points in hard-to-reach areas. While they are too small to be used effectively on larger muscle groups, lacrosse balls are a great choice for anyone who wants to enjoy the benefits of self-myofascial release anytime and anywhere. What sets the TriggerPoint Performance Foam Massage Ball apart from other massage balls on our list is its layered construction, which not only makes the ball more comfortable to use but also adds to the ball’s durability. This ball also has a softer feel to the surface which feels almost foam like. This makes it great for massaging areas that are delicate or surrounded by bony joints. This ball is particularly useful for massaging the neck, upper back and hip area. The TriggerPoint performance Foam Massage Ball is also ideal for pinpointing and releasing tense areas in the back, calves, feet, glutes, neck, pectorals, and shoulders, although the massage may not be intense enough for some users as the foam makes it a little soft for some areas. It is available in two sizes (2.6 inches and 5 inches) and two densities (firm and extra firm). This ball by Triggerpoint Therapy is one of the better massage balls on the market. The 2.6-inch ball is slightly smaller than your standard massage ball (it’s larger than a golf ball and smaller than a tennis ball). Its unique size makes it perfect for getting access to smaller areas than most massage balls. If there is a negative of this massage ball, it would be that it does lose its shape, however, it still does its job well. That being said, this is only true of the 2.6-inch ball as the 5-inch seems to be more durable. Both the 2.6-inch and the 5-inch will provide a good massage, but if you have to get one, we’d recommend getting the smaller size as it’s more versatile. The Orb is designed to deliver a deeply penetrating soft-tissue massage that reduces muscle tightness, improves flexibility, and enhances muscle performance. This durable and relatively inexpensive massage ball is made from high quality, high-density EVA foam, which helps break up pockets of lactic acid to speed muscle recovery. The ball is available in three sizes (3 inches, 4.5 inches, and 5 inches) for treating different areas of the body. 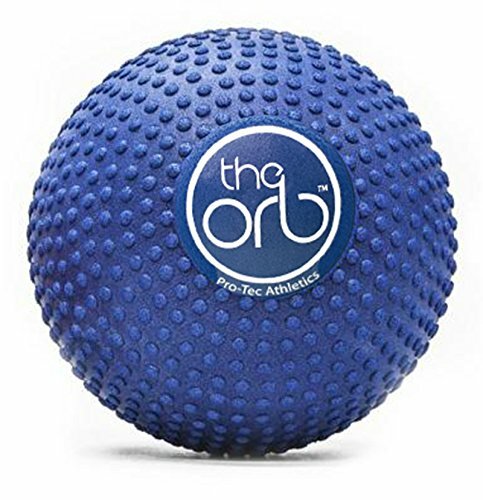 What we love about The Orb is that its surface is covered with rounded bumps that not only provide extra traction for multi-directional massage, but also help you target difficult-to-reach areas of the body to achieve myofascial release – such as the hamstrings, shoulder blades, and piriformis. That said, The Orb provides a deep penetrating massage that may be too intense for some. Depending on your pain tolerance and the areas of the body you’re treating, The Orb may be too firm for you. 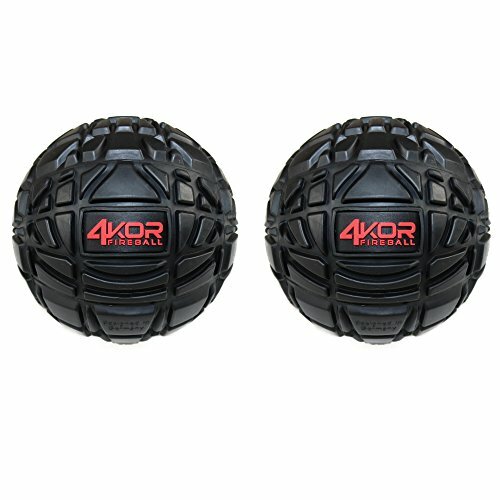 4KOR Fitness Massage Balls are made from dense thermoplastic rubber and feature grid-like surfaces that provide a more intense, effective, and efficient deep-tissue massage. Measuring 3.2 inches in diameter, the balls work well on all muscle groups. While the 4KOR Fitness Massage Balls are among the higher priced options on our list, they are backed by a lifetime satisfaction guarantee, making them an excellent long-term investment for anyone who wants to perform myofascial release at home. One minor issue with the 4KOR Massage Balls is that they are more difficult to clean than The Orb or other massage balls that have raised bumps instead of grooves. That said, most customers are pleased with the performance and durability of the 4KOR Fitness Massage Balls. With its lightweight foam construction, non-slip surface, and compact size, it’s easy to see why the GoFit Massage Ball is so popular among fitness enthusiasts, yoga practitioners, and athletes of all skill levels. It is ideal for massaging virtually all of the muscle groups and features a solid core for targeting deep knots. 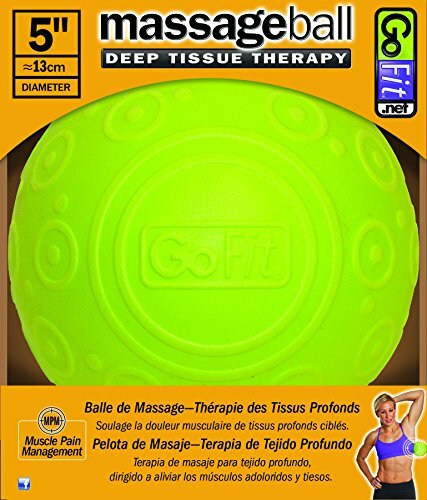 The GoFit Massage Ball is part of GoFit’s Muscle Pain Management System, which also comprises the GoFit Polar Massage Bar, the GoBall Targeted Massage Ball, and other innovative myofascial release tools. We love the soft textured surface of the GoFit Massage Ball, which not only feels comfortable against the skin and also resists slipping on walls and hard floors. The included training manual is another plus. A few customers have complained that the GoFit Massage Ball is too hard, especially when used on the back or neck. If you have a high tolerance for pain or want to perform a deep tissue massage, however, the GoFit Massage Ball is worth a look. The R.I.C.E. method of muscle recovery consists of four components: rest, ice, compression, and elevation. 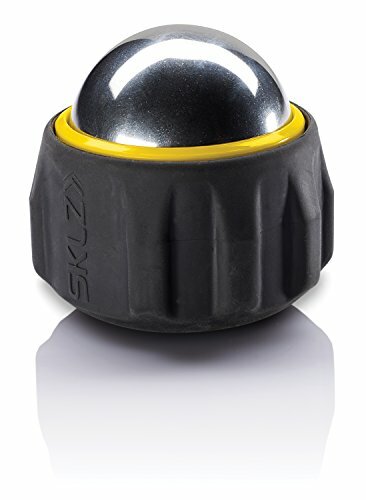 The Cold Roller Ball by SKLZ satisfies two of these components (compression and ice) by combining targeted massage with cold therapy. The ball is made from stainless steel and insulated with a gel that helps maintain the ball’s cool temperature. The ball sits inside of a housing that acts as a grip, giving you greater control when treating difficult-to-reach areas of the body. This versatile, portable massage ball is a great tool for athletes and fitness enthusiasts of all levels, although you’ll need to use it on bare skin to get maximum results. The HYPERSPHERE Vibrating Ball by Hyperice boasts a multi-speed vibrating feature that helps soothe tight muscles and break up constricted fascia within the back, calves, feet, forearms, glutes, hamstrings, hip flexors, and shoulders. The ball is designed to help you target areas of the body that are difficult to treat with a foam roller. A favourite among athletes, the HYPERSPHERE has been used by the likes of Blake Griffin, Hope Solo, and Troy Polamalu. The HYPERSPHERE measures just 5 inches in diameter, making it a great choice for anyone who is on the go. That said, the lack of foam padding may make this ball uncomfortable for some. If you have a low pain tolerance or want to treat sensitive areas of the body like the neck, the Hyperice HYPERSPHERE Vibrating Ball may not be the right choice for you. This uniquely designed massage ball features extra-firm, high-profile bumps that are uniformly spaced to help you pinpoint tender spots and trigger points deep within the fascia. It is available in two densities: firm and extra firm. 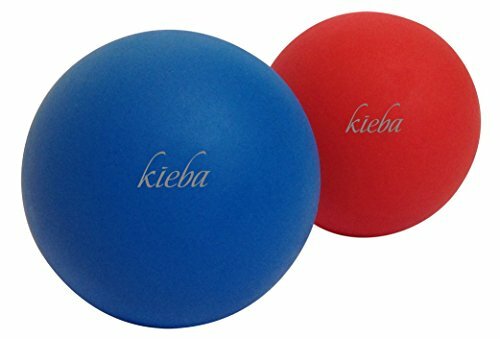 What makes this massage ball different than the other massage balls on our list is its included base, which allows you to position the Beastie Ball with one of its bumps pointing straight up. You can also use it without the base like a traditional massage ball. One minor downside of the Beastie Ball is that it is available in only one size and is therefore only ideal for massaging smaller muscle groups. Another complaint from some customers is that the ball is too firm. If you can tolerate an intense deep-tissue massage, this may be just the right ball for you. The only issue with it is that it is very firm and almost too effective. This means that it may be a little painful to use for a beginner. However, if you’ve exhausted all the most common myofascial release tools and are looking for a step up, the Beastie Ball could well be worth a go. If you are interested to find out more about this massage ball, see our Beastie Ball review. The Foot Star 2-Inch Massage Ball is the ideal tool for anyone who wishes to benefit from a shiatsu-style massage at home, at the office, or anywhere in between. Measuring just 2 inches in diameter, this ball is small enough to toss in a pocket, purse, or gym bag and take along with you. 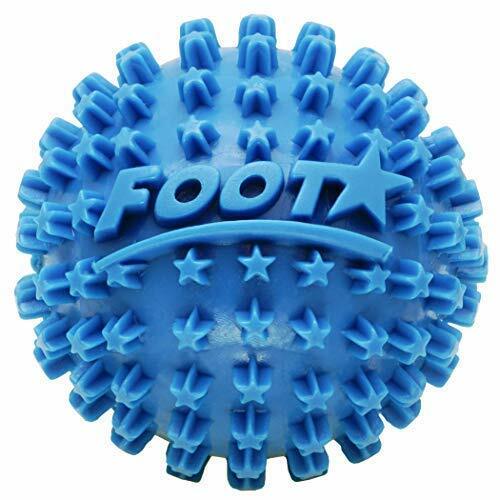 The Foot Star 2-Inch Massage Ball features a solid polyurethane core and non-intrusive “spikes” that allow you to target trigger points and release muscle tightness not only in the feet, but also in the calves, hamstrings, hands, and forearms. Some customers have reported that the ball’s spikes are too sharp, especially on bare feet. Another complaint from some customers is that the ball has an unpleasant rubber odour. 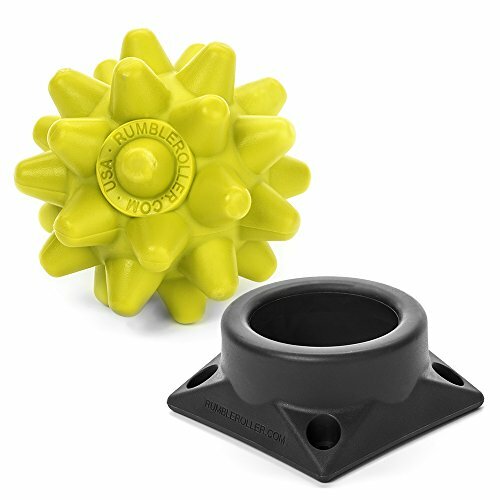 Despite these minor defaults, most customers find the Foot Star 2-Inch Massage Ball to be extremely effective in targeting trigger points in areas of the body that are difficult to reach with foam rollers. 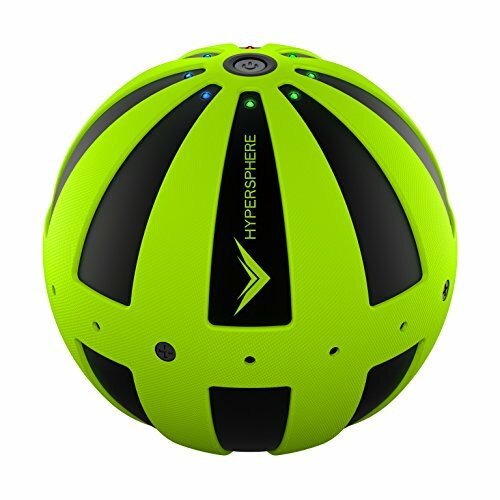 Like the Hyperice HYPERSPHERE Vibrating Ball, the InfinityBall 4-Speed Vibrating Massage Ball features a vibrating function that provides deep penetration of the muscles in the back, legs, neck, and other problem areas. Its design is different from that of the HYPERSPHERE, however, in that it is not a single sphere. Rather, it is two connected spheres that can be “wrapped” around different parts of the body for a more targeted massage. 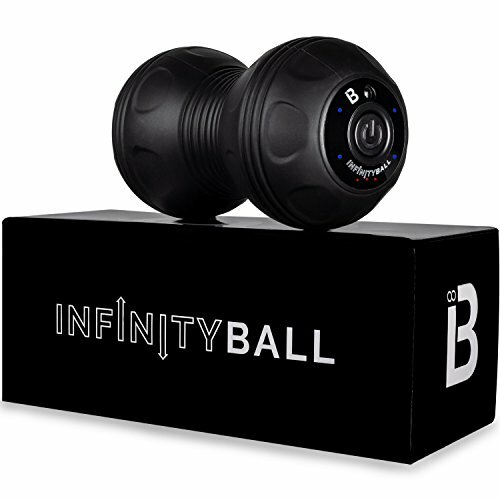 In terms of price, this is one of the more expensive choices on our list, but it is backed by a no-questions-asked warranty that allows you to try the ball risk-free. Editors Recommendation: Which Ball Should You Get? I’ve tried all kinds of massage balls to help increase range of motion, release trigger points and relieve tension in my body over the years. Out of all the balls, I’d recommend the standard lacrosse ball as the best overall massage ball due to its durability, firmness and size. All these factors make it the most versatile of all the massage balls listed. The fact that it is also the cheapest is also another reason why it’s a good choice. Note* There are many options of lacrosse ball and most of them are all the same. Beginners may find it extremely painful to use, however over time and with enough use you should get used to it. If you want something softer and gentler, then the Triggerpoint 2.6 inch massage ball is a good choice as well. If on the other hand, you have used massage balls for a while and want the most intense ball you can find, then the Beastie Ball is the winner in this category. However, the most important thing to realise is that there is no best massage ball that will work for everyone, it really depends on what part of the body you are looking to use it on. The peanut massage ball is most commonly known for its use in rolling down the spine and not much else. However, I have found that its unique shape can create a slightly different massage to using just one massage ball. For instance, I have found rolling my quads or calves down the centre has unveiled tender spots I never knew I had. It’s also much easier to roll up and down with this kind of massage ball as it stays in one trajectory rather than rolling around. Whilst this ball may not be as essential as the others, for its low price it’s worth having in any case. If you’d like to find out more, take a look at our page on the best peanut massage balls. As suggested earlier, you can use any ball lying around your home, it all depends on what your preferences are. However, you’ll find that the balls mentioned above are likely to be more effective as they have just the right set of qualities for effective myofascial release. What’s more, is that most of them are cheap yet will provide benefits much greater than their initial costs. Choosing the right massage ball is the key to performing effective myofascial release at home, whether you’re just beginning a fitness program or are a professional athlete, consider adding a massage ball to your arsenal of myofascial release tools.